An abdominoplasty is a major surgical procedure that will remove excess skin and fat from the lower abdomen and tighten the abdominal muscles. An incision is made across the lower abdomen from hipbone to hipbone. A second incision is made around the belly button. The skin and fat are separated from the abdominal wall. Excess skin and fat are then excised. 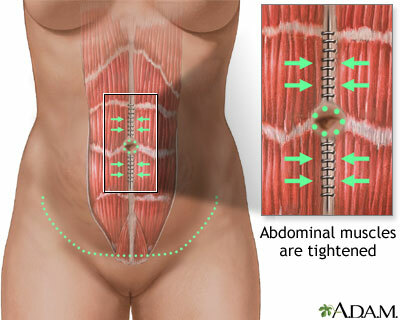 The abdominal muscles are tightened by shortening them and suturing them together. A small incision creates a new opening for the belly button. It is brought out through the opening sutured to the new skin. Stretch marks and scars may be removed during surgery. Drains may be placed in the skin and removed a few days later. The drains reduce swelling by collecting excess blood and fluid. All incisions are closed. 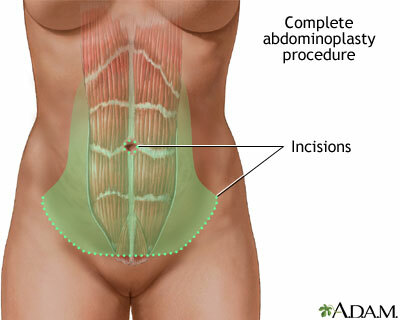 Illustrations shows incision lines for a full tummy tuck. See Mini Tummy Tucks for information regarding partial abdominoplasty surgery.